Video transcript: "Taxi driver curry. – Roaming London in the early 1970s, English art student David Esslemont tastes his first Indian curry – he likes it. Today a professional artist, book designer and printer, Esslemont lives in rural Iowa, a Midwestern American state so vast that England would fit comfortably within it’s borders. Unfortunately Iowa has just twenty-four Indian restaurants – a mere shadow of England’s thousands. Where, Esslemont wondered, can I go to get a decent curry? Always a lover of good food, Esslemont began experimenting with his own recipes. His love of cooking became a passion – in 2013 he turned the recipe for his prize-winning chili recipe into an award-winning limited edition book. This ambitious project begins with weeds and fire as the ground is cleared to plant wheat – clay is mixed with sand to make adobe bricks, and concludes with the magic of cooking in a wood-fired oven, with ferocious heat, rolling flames, and the tantalizing aromas of home-grown pizza. A from-scratch recipe in woodcuts for making your own pizza. My binding of New York Revisited by Kenneth Auchincloss is part of this touring exhibition organized by Designer Bookbinders UK. "InsideOUT celebrates the art and craft of contemporary bookbinding and private press printing. This ambitious project is a collaboration between thirty-four binders based in the United Kingdom and twenty-five based in North America." New York Revisited was designed, illustrated with colour wood engravings and printed by Gaylord Schanilec, and published in 2002 by The Grolier Club, New York. 7 x 12 inches. 44 pages. Edition of 250 copies (this copy ex-edition), 9 full-page color wood engravings and 2 vignettes by Gaylord Schanilec. Type composed in Emerson Monotype. Printed on Zerkall mould-made paper. 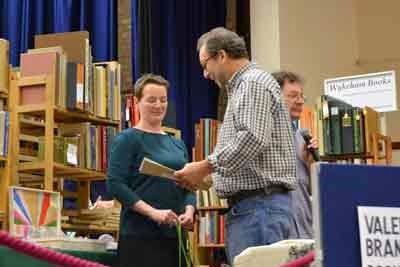 I was delighted to receive the Printmaking Today Award for "Innovative Printmaking" from it's Editor, Nancy Campbell, at the Fine Press Book Fair in Oxford 2013, for Chili: a recipe. "Prize-winning chili in an award-winning book."